An interview with a Japanese magazine has revealed a ton of intriguing details about Pokemon Ultra Sun and Ultra Moon. Shigeru Ohmori and Kazumasa Iwao sat down with Famitsu to discuss Game Freak's upcoming Pokemon game. While fans were initially critical that Game Freak appeared to be "remaking" Pokemon Sun and Moon just a year after those games were released, recent trailers have indicated that Pokemon Ultra Sun and Ultra Moon will be a much different and more expansive game. Perhaps the biggest surprise is that players will be able to catch Legendary Pokemon from other regions in Pokemon Ultra Sun and Ultra Moon. While discussing the "Ultra Warp Ride" that allows players to ride either Solgaleo or Lunala and visit the mysterious Ultra Space, Iwao and Ohmori mentioned that players can visit a world where other Legendary Pokemon live. 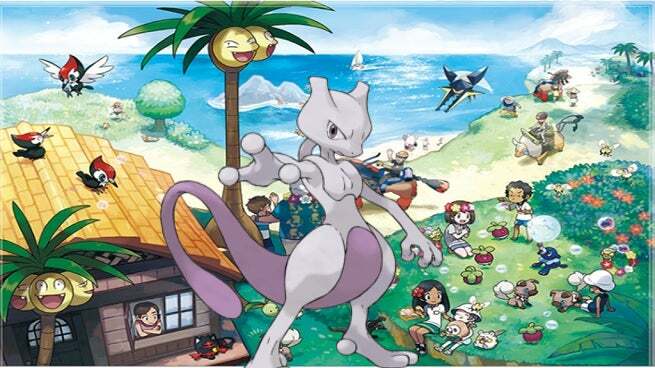 A lot of details about this strange new world (such as whether it's a new Ultra Space, or a place in a different region) wasn't disclosed, but the pair mentioned that players would be able to catch Mewtwo in Pokemon Ultra Sun and Ultra Moon as a specific example of the surprises this new world would bring. We speculated last month that Pokemon Ultra Sun and Ultra Moon would have more Legendary Pokemon after the Pokemon Company announced that most Legendary Pokemon could be used in competitve play. As Pokemon Sun and Moon didn't have a lot of "traditional" Legendary Pokemon, the new rules implied that the old Legendary Pokemon were coming back somehow. This isn't the first time that a player could capture Legendary Pokemon from other regions in a game. In Pokemon Omega Ruby and Alpha Sapphire, players could travel through strange portals (created by Hoopa) to battle Legendary Pokemon from multiple regions. The other major note from the article was that Pokemon Ultra Sun and Ultra Moon will be a much larger game than its predecessors. Iwao and Ohmori noted that the script for Pokemon Ultra Sun and Ultra Moon was twice the size of Pokemon Sun and Moon. Game Freak compared the changes in Ultra Sun and Ultra Moon to that of Pokemon Platinum, which featured an expanded version of the Sinnoh version and a much deeper storyline than its predecessors Pokemon Diamond and Pearl. In fact, there could be even bigger and more "ultra huge" changes in store for the game, which certainly sounds like a positive. We know that the games will feature the Ultra Recon Squad, a group of characters from a world damaged by the Legendary Pokemon Necrozma. These characters make appearances early in Pokemon Ultra Sun and Ultra Moon's storyline and show how quickly the games deviate from the originals. Another thing that will be different in Pokemon Ultra Sun and Ultra Moon is that Pokemon will be easier to catch and train than in Pokemon Sun and Moon. A lot of Pokemon could only be caught in the game under specific sets of circumstances, something that really frustrated players. It's one thing to hunt for rare Pokemon, but Pokemon Sun and Moon took "rareness" to an extreme. Pokemon Ultra Sun and Ultra Moon comes out on November 17th.